Kirbie Goes to Hollywood: "Hand in my Pocket"
If you're 23 or feel like you've entered a quarter-life crisis, listen to Alanis Morrisette's song "Hand in my Pocket." I have loved this song since I was in fourth grade, however didn't get the meaning of this until I "grew up." Things have been a little odd in my life so I guess I should share. I have been strongly debating this week about moving back to Texas. One day I was positive that I was going to. But then opportunities present themselves here and I get excited again. I've been a little torn as to what I'm doing with my life but I know I need to be patient and things will pan out. I've also been feeling a little unproductive because I haven't been learning much and I'm eager to do something!!! I don't know what. I'm considering dance class and looking into on-camera classes, maybe an internship. My whole goal is to learn all aspects of a TV show or broadcast so I'm not just someone in front of the camera, I'm also knowledgeable about everything else. So that's where I've been personally. However I've been working this week which is good for my psyche but also a little scary because it's been a lot of learning new equipment and programs that I'm not familiar with. However it's good to feel like I'm necessary out here. Enough of the personal stuff. Here's the juicy info I know you want to hear! And forgive me if this post is incoherent, I think I have a stomach bug so I'm a little out of it. - I made a new friend at the gym. Well, not exactly. 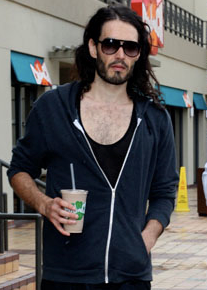 But I seriously see Russell Brand there all. of. the. time. It's insane. It just so happens that my last gym date happened to be a day that Russell was there and he held the door open for me as I was entering and he was exiting. And they say chivalry is dead! The Grammys are this Sunday, so perhaps I'll have some more opportunities to report! I have been neglecting KGTH because I've been working hard on getting a webhost, a domain and all that jazz for my personal portfolio site. It's not rocket science but I'm unfamiliar with this type of thing, so it's been difficult. If you want to check out the site, the link is here. Notice that the URL doesn't show up as kirbiejohnson.com but as http://kirbiejohnson.com/Kirbie_Johnson____Texas_Twang,_Cali_Chic/Welcome.html. What gives? If anyone can help me without making a huge mess that would be AWESOME. All I want is for the home page (or main page) to read as kirbiejohnson.com and not all that other crap. I might be able to help you out! Where are you hosting? I noticed you named your home page file Welcome.html, the page you want your URL to land on should almost always be named index.html and should be placed directly on the server folder. When someone types your URL, the first thing the web host looks for is an index.html file to land on. As far as the Kirbie_Johnson____Texas_Twang,_Cali_Chic goes, you probably have all your files inside that folder instead of the main server folder so the URL will display exactly where it went to find a specific file. Ligia - what's your e-mail? This is helping but I should probably give you some more deets on how I made the site :) Thank you!! !